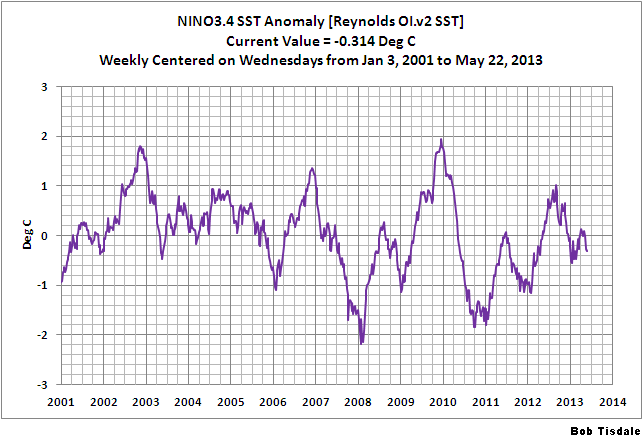 The May 2013 Reynolds OI.v2 Sea Surface Temperature (SST) data through the NOAA NOMADS website won’t be official until Monday, June 10, 2013. Refer to the schedule on the NOAA Optimum Interpolation Sea Surface Temperature Analysis Frequently Asked Questions webpage. 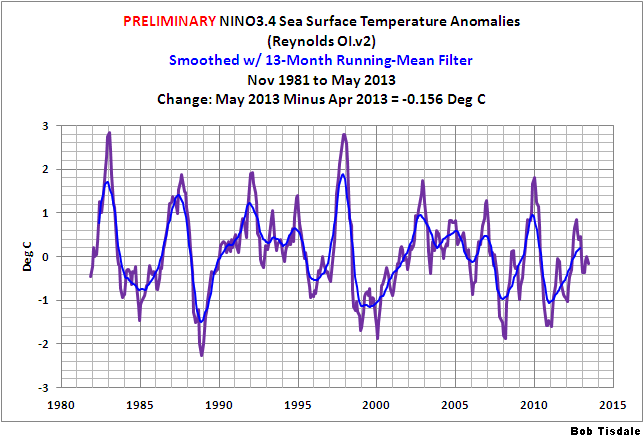 The following are the preliminary Global and NINO3.4 SST anomalies for May2013 that the NOMADS website prepares based on incomplete data for the month. I’ve also included the weekly data through the week centered on May 22, 2013, but I’ve shortened the span of the weekly data. As noted in the recent mid-April update, I’ve started using January 2001 so that the variations can be seen AND so that you can see how “flat” global sea surface temperature anomalies have been since then. The base years for anomalies are 1971-2000, which are the standard base years from the NOAA NOMADS website for this dataset. 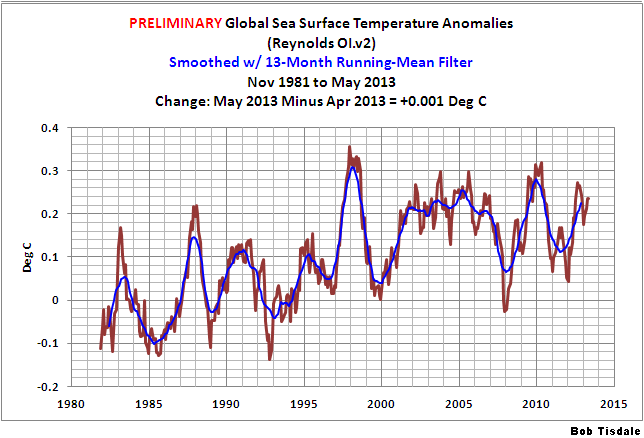 The preliminary global sea surface temperature anomalies were basically unchanged (+0.001 deg C) in the last month. The global sea surface temperature anomalies are presently at about +0.24 deg C. That of course will change a little when the full month of data is reported in a couple of weeks. The sea surface temperature anomalies of the NINO3.4 region in the eastern equatorial Pacific (5S-5N, 170W-120W) are a commonly used index for the strength, frequency, and duration of El Niño and La Niña events. Based on the preliminary data, May 2013 NINO3.4 sea surface temperature anomalies are below zero (about -0.16 deg C), but not yet in La Niña conditions (cooler than -0.5 deg C). That indicates we’re in ENSO-neutral conditions, meaning the tropical Pacific is not showing El Niño or La Niña conditions. 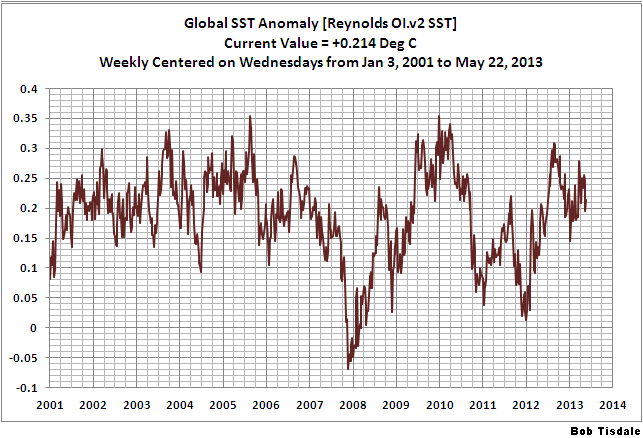 Also refer to the weekly data that follows because they have cooled a little more. Weekly NINO3.4 region (5S-5N, 170W-120W) sea surface temperature anomalies for the week centered on May 22, 2013 have been edging cooler over the past couple of weeks. The weekly NINO3.4 sea surface temperature anomalies were approximately -0.31 deg C.
Weekly Global SST Anomalies have shown some volatility over the past few weeks: a reasonably large drop, and partial rebound. They are presently about +0.21 deg C. The average global sea surface temperature anomaly since January 2001 is about 0.18 deg C, and it really doesn’t seem to be wandering too far from that average. Why should you be interested? Sea surface temperature records indicate El Niño and La Niña events are responsible for the warming of global sea surface temperature anomalies over the past 30 years, not manmade greenhouse gases. I’ve searched sea surface temperature records for more than 4 years and ocean heat content records for more than 3 years, and I can find no evidence of an anthropogenic greenhouse gas signal in either dataset. That is, the warming of the global oceans has been caused by Mother Nature, not anthropogenic greenhouse gases. Who Turned on the Heat? was introduced in the blog post Everything You Ever Wanted to Know about El Niño and La Niña… …Well Just about Everything. The Free Preview includes the Table of Contents; the Introduction; the beginning of Section 1, with the cartoon-like illustrations; the discussion About the Cover; and the Closing. The book was updated to correct a few typos. Please buy a copy. (Credit/Debit Card through PayPal. You do NOT have to open a PayPal account. Simply scroll down to the “Don’t Have a PayPal Account” purchase option. It’s only US$8.00. In reply to: Physicist-retired #1.1 Now we get to watch what the Arctic is going to do this season. I would bet that there is going to be a substantial difference this year as compared to last year. This last winter can not be ignored for the depth and longevity of the season. The CET record shows how weather cycles come and go in the NH. I am surprised that the CET is not used as the ultimate arbiter of current weather and climate over any models. The North Atlantic is changing over to it’s cold phase. The Pacific is already in a cold phase. The solar minimum is close. What is going to happen next? The North Atlantic is changing over to it’s cold phase. Put it here, and be specific – what minimum sea ice volume will we see in 2013? I’ll bookmark it. In reply to: Physicist-retired #1.8 I figured big boys like you would know what I meant by ‘6’. That would be 6 as in 6 mil on the NSIDC chart that is put out daily. Last year dipped to around 3.25 mil. I am saying that the loss will stop around 6 mil. Now we have to wait until September to find out. Any prediction on your side that you would like to make. Looking at today’s NSIDC, the 2013 sea ice extent just crossed above the 2012 track. Considering how cool the NH still is, it is not hard to imagine that the sea ice will be significantly different from last years cyclone influenced ice breakup given that we just had such a deep winter. Yet Physicist retired then posts a link as proof of his thought, http://neven1.typepad.com/.a/6a0133f03a1e37970b017eeacf2dbb970d-pi. This link shows a projected 2013 NSIDC trend line that has already missed its prediction starting at the end of January. Now it is well under the actual sea ice extent. He says under 4 million km and I say no less than 6 mil. How can they stay so confident when reality steadily shows the fallacy of their thought? I wish that I actually could afford to wager with this guy. I am a betting man at times. I am a retired programmer. I used to model industrial processes 40 years ago. My friend here in the UK put solar panels on his roof 2 years ago. Now after a run of increasingly cold winters, I have to decide whether to do the same, or to instead install an air-to-air heat pump. I watched the 2008 TV program “Climate Wars”. That presented curves showing how global temperature rose between 1980 and 1990 according to (obviously patchy) terrestrial ground station data, but fell according to the new satellite data. Then, we were told, the satellite people realised that orbits had been decaying, and after correcting for this the satellite data miraculously agreed with the ground station data, and has done every since. But if orbit decays and the satellite descends, its perceived infra-red radiation must increase from geometry and from having (very slighty) less atmosphere to cross. So any error from orbit decay should show in the direction of increased perceived global warming. Since then it occurred to me that the claim might be saved by a decrease in double counting by less overlap on the earth’s surface of the cones of radiation collection from adjacent satellites. I do not want minute calculations about the balance between these various effects to take over the rest of my life, and delay my decision on how to heat my house. Perhaps they are confident because they actually understand the physical processes and can do a little bit of math? It’s been nearly a month since your discussion with a Physicist-retired took place. Are you still of the belief that the minimum will be around 6 Mkm^2? Not one scientific group that I know of is predicting anything more than 5 Mkm^2 for this year’s *average* September extent. Get that? Not the minimum, but the monthly average is predicted to be no more than 5 Mkm^2 by the scientists that study the arctic. Now, who should be confident – those that are in agreement with all the scientists in the world – or those who believe they are smarter than said scientists? BTW – what was your prediction last year? Or the year before?